KRATER COMEDY CLUB: Until Jan 14/18, 7pm/8pm/10.30pm, £5-£36.50 Komedia, 44-47 Gardner Street, Brighton 0845 293 8480. HEADSTRONG CLUB: Blay Whitby on the ethics of robots, a talk followed by discussion. 8pm Elephant and Castle, Lewes. £3. LEWES RIVERSIDE CLUB: Gravestones by Kevin Gordon, 2pm St Thomas’ Church Hall, Cliffe, Lewes. ANNA NEALE: Cranleigh Arts Centre, Cranleigh, 7.30pm. SWING PATROL: £7-£10, 7pm Latest MusicBar, 14-17 Manchester Street, Brighton (01273) 687171. 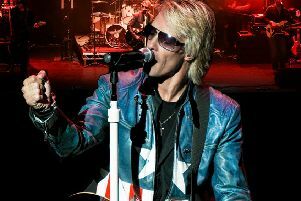 WRONG JOVI: £18, 7.30pm White Rock Theatre, Hastings (01424) 462288. Bon Jovi tribute band. DANCE TO THE MUSIC: £32, 7.30pm The Hawth Theatre, Crawley (01293) 553636. Starring Kristina Rihanoff. STRANGERS ON A TRAIN: Until January 13, £13.50-£47, various times, Theatre Royal, Brighton, 0844 871 7650. THE START OF SOMETHING: £10, 7.30pm and Jan 13, Chiddingly Village Hall. A play about three women telling their story. Email the dramawheel@gmail.com. THE PLAY THAT GOES WRONG: January 10-14, tickets from £15, Chichester Festival Theatre, www.cft.org.uk, 01243 781312. PLASTIC ACTION WORKSHOPS: 10am-1pm Linklater Pavilion, Lewes. Continuing the Plastic-Free Lewes Project, a workshop hosted by Transition Town Lewes. Free. WALK: Meet 2pm at Storrington Recreation Ground car park, RH20 4PG. 4-mile HDC Health walk (2 stiles) through the National Trust’s Sullington Warren with its heathland, pine woodland and ancient burial grounds then on to Sullington Manor Farm. Dogs welcome. 1¾ hours. Mick Denness 01903 745971. WALK: Meet 10am in the Warnham Village Hall car park in Hollands Way RH12 3RH. 3-mile circular HDC Health walk, some hills and stiles, through woods and farmland, past Warnham Manor and across the deer park. Dogs on a lead. 1¾ hours. Liz 01403 263920 or Simon 01403 260599. DAVID RAMIREZ: £10, 7.30pm Komedia, 44-47 Gardner Street, Brighton 0845 293 8480. Plus Kerri Watts and Cheeseburger. FLUFFMUFFLER: £6, 8pm Latest MusicBar, 14-17 Manchester Street, Brighton (01273) 687171. Plus New York Dollies. HORSHAM ROCKS PRESENTS: The Gibbons Hyldon experience, The Carfax Bandstand, Horsham, 1pm-3pm. LEWES SATURDAY FOLK CLUB: £4, 8pm Elephant and Castle, Lewes. Wassail by Fie and Candlelight. LOOSE CABOOSE NIGHT: 7.30pm, Lewes Con Club, 139 High Street, Lewes 01273 473076. SING FOR A CURE: Stage and Screen, 7pm, £14.50, The Capitol, Horsham, 01403 750220. For the third year running Matt Cowling is pleased to present his best show ever. More musicians, more singers, more ‘wow’! A live music concert suitable for all the family that’s raising money for research into Type 1 Diabetes. SOME GUYS HAVE ALL THE LUCK: £21, 7.30pm White Rock Theatre, Hastings (01424) 462288. The Rod Stewart Story. STONE COLD SOBER: The Malt Shovel, Horsham, 8.30pm. THE BILLY JOEL SONGBOOK: Saturday, January 13. Tickets from £20, Minerva Theatre, Chichester, www.cft.org.uk, 01243 781312. WILL AND WOLFE: Free, 10am-noon at the regular coffee morning, Under Ground Theatre, Grove Road, Eastbourne 0845 680 1926. RAPUNZEL: £15, 2pm/7pm (2pm Jan 14) The Hawth Theatre, Crawley (01293) 553636. COS Musical theatre. THE MAGIC FLUTE: £25, 7.30pm The Hawth Theatre, Crawley (01293) 553636. Opera Up Close. Antique and Collectors Fair: Westgate Leisure Centre, Via Ravenna, Chichester, PO19 1RJ. A wide variety of antiques and collectables including china, glass, gold and silver, Art Deco, jewellery, small furniture, dolls, linen and lace, military badges, plus coins, stamps and postcards. Public admission from 10.30am to 4pm, £2, buying and selling. Call Emmott Promotions on 07747 604541 or 01243 788596 or visit www.emmottpromotions.co.uk. BEACHY HEAD RAMBLERS: A Winter Wander, Maybe Snow? 10.5 miles with Doris and Gavin B 07552 763683. Meet outside Bede’s School, Dukes Drive, Eastbourne, 10am. LEWES FOOTPATHS GROUP: Isfield, 5 miles with Jeannette and Margaret 812423. Meet at North Street car park, Lewes, 9.30am. BOWIE EXPERIENCE: £27.50, 7.30pm Theatre Royal, Brighton 0844 871 7650. The Golden Years Tour. FAITH: £24.50, 7.30pm The Hawth Theatre, Crawley (01293) 553636. The George Michael Legacy. JAZZ LUNCH: £21.95, noon, The Hawth Theatre, Crawley (01293) 553636. With Derek Nash. THE ADULT PANTO: £19, 7.30pm White Rock Theatre, Hastings (01424) 462288. Sinbad The Seaman. (Not suitable for under 16s). THE SIMON AND GARFUNKEL STORY: £23-£26, 7.45pm Theatre Royal, Brighton 0844 871 7650. BRING YOUR OWN BABY COMEDY: Noon, Komedia, 44-47 Gardner Street, Brighton 0845 293 8480. Rachel Parris, Kate Smurthwaite, MC Jan Brister. BRIGHTON: 8pm. Unattached? The Group is a club for men and women aged 50+ which meets in Brighton on the third Tuesday evening of every month. An opportunity to meet new friends. Walking, eating out, theatre, golf, holidays –all arranged by members. Visit www.thegroup.org.uk and then give The Group a call. LEWES LITERARY SOCIETY: Lessons From History: Bravery, Forgiveness and Unity by Chris Cleave. 8Pm All Saints Centre, Friars Walk. £10. MID SUSSEX RAMBLERS: The Greensand Ridge and North Downs near Limpsfield, 9.1 miles with Paul J 01444 441530. Meet at High Chart car park, Moorhouse Road, Limpsfield Chart, 10am. SEAFORD LECTURE AND LITERARY CLUB: Lawrence of Arabia: Hollywood Fact or Fiction by Sarah Green, 7.30pm St Leonard’s Church Hall, Seaford. Contact No 01323 899932. Horsham Holistic Health: Mind, body and spirit group. Sound Bath with Annette de Saulles, 7.30pm, Friends Meeting House, Worthing Road, Horsham. Cost £7. Contact Tina on tina@rainbowoasis.co.uk or 07857 545 678. WALK: Meet 10.30am, Forestry Commission Car Park – Roosthole – on Hammerpond Road RH13 6PG. New circular four-mile HDC Health walkthrough the Forest. Will be muddy. No stiles. Well behaved dogs welcome. 2 hours. Jill 07780 701184. THE CIRCUS OF HORRORS: £14-£30.50, 7.45pm Theatre Royal, Brighton 0844 871 7650. The Voodoo VaudEvil. STAND UP AND SLAM: £5-£10, 8pm Komedia, 44-47 Gardner Street, Brighton 0845 293 8480. BEACHY HEAD RAMBLERS: Three Ways From Wilmington, 10.5 miles with Brian S 07726 961740. Meet t Wilmington Priory car park, 10am. MID SUSSEX RAMBLERS: Pub Social at The Plough, Plumpton Green, 7.30pm. Southwater Horticultural Society: ‘My Years as Head Gardener at Little Mynthurst Farm’. Presented by Mark Dobell. The Village Hall, Church Lane Southwater, 7.30pm. Formerly Head Gardener and Estate Manager of the 125 acre farm and gardens, Mark tended the 10 acres of gardens for 25 years. Little Mynthust Farm was once the home of Lord Baden-Powell, of Scouting fame. Non-members welcome £1. Free to members. Membership £7.50 (£12 family). Call 01403 730897 or join at the door. Email southwaterhs@yahoo.com. TALK: SolarAid by Jamie McCloskey, 7pm Linklater Pavilion, Lewes. Part of the LewesLight series of talks. £3. TALK: Flint: Lewes’ ubiquitous building material by Flintman, David Smith. Lecture Room, Lewes Town Hall, 7.45pm. £3. WALK: Every Wednesday. Meet 10.30am at the bandstand, Carfax, Horsham, RH12 1FD. Choose a 30 or 60 mins flat HDC Health walk on good paths around Horsham park and pond. Suitable for elderly and those recovering from illness. Wheelchairs and buggies welcome. Dogs on a lead. Doreen 01403 230293 or Wyn 01403 256630 or Emmy 01403 255517. SOMEONE LIKE YOU: £23, 7.30pm Theatre Royal, Brighton 0844 871 7650. The Adele Songbook. HAYWARDS HEATH CERAMICS GROUP: Monthly meeting with a talk on ‘London’s Victorian Potters 1850-1901’ by Diana Lloyd. Diana has a Diploma with Distinction in Fine and Decorative Arts from Inchbald School of Design and lectures extensively on ceramics and glass. Lecture in the Studio, Clair Hall at 10.35am. Doors open at 9.45am with coffee served until 10.20am. Suspended admittance fee for January meeting. Non-members are very welcome by prior arrangement with the membership secretary (01444 483372 or 414477). Visit hhcg.org.uk. POLEGATE RAMBLERS: Butts Brow to Blow Cobwebs Away, 4.5 miles with Wendy 520015 or Betty 640663; or, The Long Walk Home, 10 miles with Lucie T 01825 840779. Meet at Wannock Road Recreation Ground, 9.30am. Doc’n Roll Film Festival: January 18-28. The UK’s Music Documentary Festival returns for its second Brighton edition with an extended programme of eight premiere films. Doc’n Roll Film Festival features music documentaries on artists and subjects as diverse as Ella Fitzgerald, John Coltrane, The The, Doom metal, Manchester’s infamous clubbing scene, the Ealing Club, Iran’s Techno scene and matters shedding light on the lack of female representation in the music industry. There will also be post-screening Q&As from the filmmakers and musicians, as well as live music events. Doc’n Roll is supported by the BFI using funds from the National Lottery. Kicking the festival off in style on Thursday, January 18, is the Brighton premiere of Manchester Keeps On Dancing at Dukes @ Komedia, featuring a Q&A with a special guest DJ (TBA). Visit www.docnrollfestival.com to find out more. BEAUTIFUL NOISE: £24, 7.30pm White Rock Theatre, Hastings (01424) 462288. A Neil Diamond Story. UNDERGROUND LIVE: £6.50, 7.30pm Under Ground Theatre, Grove Road, Eastbourne 0845 680 1926. The Andy Drury Disorder with Milton Hide. Duke Of York’s (0871 902 5728): Kids’ Club: Shaun The Sheep Movie (U) Sat 10.30. Sarah’s Key + Q&A With Dorit Oliver-Wolff (12A) Tue 2.15. Orion (01444 243300): Coco (PG) Sat & Sun 12.30, 3.00. Jumanji: Welcome To The Jungle (12A) Fri & Mon-Thu 5.00; Sat & Sun 4.45. The Greatest Showman (PG) 5.30, 8.15. Star Wars: The Last Jedi (12A) Fri & Mon-Thu 7.45; Sat & Sun 1.10, 7.45. New Park (01243 786650): The Greatest Showman (PG) Fri & Thu 12.45, 6.00; Sat 3.15, 8.30; Sun 12.45, 5.45; Mon 1.15, 8.15; Tue 12.00, 4.30; Wed 3.30, 8.30. Professor Marston And The Wonder Women (15) Fri 3.30; Sat 6.00; Thu 3.30. Brigsby Bear (15) Fri 8.45; Mon 4.00. Mountain (PG) Sat 1.15; Mon 6.15; Tue 2.30. Ferrari: Race To Immortality (15) Sun 3.30; Wed 6.15. Happy End (15) Sun 8.30; Wed 1.00; Thu 8.45. Rigoletto (2018) (PG) Tue 7.15. Arts Centre (01483 278000): Dunkirk (PG) Sat 2.00, 8.00. Curzon (01323 731441): Molly’s Game (15) 2.10, 4.50, 7.45. All The Money In The World (15) 2.00, 8.00. The Greatest Showman (PG) 2.05 (not Sat & Sun); 5.05, 8.10. Jumanji: Welcome To The Jungle (12A) 5.00. Paddington 2 (PG) Sat & Sun 2.05. Scott Cinemas – The Atrium Cinema (01342 321666): Jumanji: Welcome To The Jungle (12A) Sat & Sun 11.45. All The Money In The World (15) Fri, Mon, Wed & Thu 2.00, 8.10; Sat 8.10; Sun 8.00; Tue 3.30. Star Wars: The Last Jedi (12A) Fri, Mon, Wed & Thu 4.50; Sat & Sun 1.35, 4.50. Darkest Hour (PG) Fri & Mon-Thu 2.00, 5.00, 8.00; Sat & Sun 5.00, 8.00. Three Billboards Outside Ebbing, Missouri (15) Fri & Mon-Thu 2.50, 5.30, 8.25; Sat 5.30, 8.25; Sun 5.30, 8.15. Ferdinand (U) Sat 10.00; Sun 10.10. Kids Crew: The Jungle Bunch (U) Sat 10.10. Coco (PG) Sat & Sun 12.20, 2.50. Kids Crew: Paddington 2 (PG) Sat & Sun 2.25. Royal Opera House: Rigoletto (12A) Tue 7.15. Pavilion (01323 841414): Only The Brave (12A) Fri, Sun & Mon 7.45. Paddington 2 (PG) Sat 11.00. AFS: Paddington 2 (PG) Sun 10.30. Menashe (U) Tue 2.15. Royal Opera House: Rigaletto (12A) Tue 7.15. Battle Of The Sexes (12A) Wed & Thu 2.15, 7.45. Clair Hall (01444 455440): Dunkirk (12A). Wednesday, January 17, 5.30pm and 8pm. The Capitol (01403 750220): All The Money In The World (15) 1.45 (not Sun, Tue & Thu); 4.45, 7.45. The Greatest Showman (PG) 2.00 (not Sun, Tue & Thu); 5.00, 8.00. Family Film Fun: The Jungle Bunch (U) Sat 10.30. Box Office Babies: The Greatest Showman (PG) Tue 10.30. Depot (01273 525354) (lewesdepot.org): Darkest Hour (PG) Fri, Sat, Mon, Wed & Thu 2.45, 5.30, 8.15; Sun 3.00, 6.15, 8.15; Tue 1.30, 5.15, 8.00. All The Money In The World (15) Fri & Sat 3.00, 5.45; Sun 5.30, 8.00; Mon, Wed & Thu 5.15, 8.00; Tue 2.45, 8.15. Walk With Me (PG) Fri 8.30; Sat 1.00, 8.45; Sun 9.00; Mon 3.30; Tue 12.00; Wed 5.30; Thu 1.45, 6.15. A Woman’s Life (12A) Fri 3.15, 5.45; Sat 3.15, 8.30; Sun 5.40; Mon 2.30, 5.45; Tue 11.45, 4.15; Wed 3.00; Thu 3.45, 8.15. Eric Clapton: Life In 12 Bars (15) Fri & Mon 8.15; Sat 6.00; Sun 2.45; Tue 2.30; Wed 2.30, 8.15; Thu 2.30. The 5000 Fingers Of Dr T (U) Sat 11.00; Sun 12.45. Doctor Zhivago (PG) Sun 2.00. Donnie Darko (15) Tue 5.30. Royal Opera House: Rigoletto (12A) Tue 7.15. Windmill Cinema (01903 715920): The Greatest Showman (PG) Fri 6.10, 8.20. Seaford Community Cinema, Barn Theatre (www.seafordcinema.org): Lady Macbeth (15) Fri 7.30. The Picture House (01825 764909): Three Billboards Outside Ebbing, Missouri (15) Fri, Mon & Wed 11.00, 1.30, 6.20, 8.40; Sat 4.00, 6.20, 8.40; Sun 10.25, 3.35, 5.40, 8.40; Tue 11.00, 2.00, 6.30, 8.40; Thu 2.00, 5.00, 8.40; Parent & Baby Screening: Thu 11.15. Darkest Hour (PG) Fri, Mon & Wed 11.15, 2.20, 3.50, 6.00, 8.35; Sat 3.30, 5.50, 6.00, 8.35; Sun 3.30, 6.00, 8.35; Tue 11.15, 2.20, 6.00, 8.35; Thu 2.20, 6.00, 8.35; Parent & Baby Screening: Thu 11.30. Molly’s Game (15) Fri, Mon & Wed 2.10, 8.20; Sat 3.05, 8.20; Sun 2.55, 5.55; Tue & Thu 2.10, 5.50; Parent & Baby Screening: Thu 11.00. Paddington 2 (PG) Fri, Mon & Tue 11.30; Sat 10.40, 12.50; Sun 10.20, 12.45. Star Wars: The Last Jedi (12A) Sat 1.00; Sun 12.35. Jumanji: Welcome To The Jungle (12A) Sat & Sun 10.35, 1.00. Saturday Morning Movie: Lego Ninjago Movie (U) Sat 10.30. Royal Opera House Live: Rigoletto (12A) Tue 7.15. National Theatre Live Encore: Follies (tbc) Thu 7.45. Dome (01903 823112): Autistic Screening: Ferdinand (U) Sat 10.15. Darkest Hour (PG) Fri & Tue-Thu 11.45, 2.30, 6.00, 8.25; Sat 12.10, 2.50, 5.30, 8.25; Sun 12.25, 2.50, 5.30, 8.25; Mon 11.30, 3.00, 5.30, 8.15. Ferdinand (U) Sun 10.20. Jumanji: Welcome To The Jungle (12A) Fri & Tue-Thu 5.40; Sat & Sun 3.10; Mon 5.55. Parent & Baby Screening: The Greatest Showman (PG) Mon 12.00. Pitch Perfect 3 (12A) Tue-Thu 6.00. Pixar’s Coco (PG) Sat & Sun 10.00, 12.40. Star Wars: The Last Jedi (12A) Fri & Tue-Thu 2.50; Sat & Sun 8.10; Mon 2.15. The Greatest Showman (PG) Fri & Tue-Thu 12.25, 8.45; Sat & Sun 5.55; Mon 8.40. Connaught (01903 206206): The Greatest Showman (PG) Fri & Tue-Thu 1.00; Mon 1.30. Darkest Hour (PG) Fri, Mon, Wed & Thu 12.00, 2.45, 5.30, 8.15; Sat & Sun 12.40, 3.20, 6.00, 8.45; Tue 12.00, 2.45, 5.30. Three Billboards Outside Ebbing, Missouri (15) Fri-Sun, Wed Thu 3.30, 6.00, 8.30; Mon 3.50, 6.15, 8.45; Tue 3.30, 8.15. Saturday Morning Pictures: Wonder (PG) Sat 10.15. Coco (PG) Sat 10.30, 1.00; Sun 10.15, 1.00. Silver Screen: Three Billboards Outside Ebbing, Missouri (15) Mon 11.00. Royal Opera House: Rigoletto (12A) Tue 7.15.